One of the best part of the holidays is figuring out the best way to package all of your gifts. For small gifts, look no further than the Pillow Box Bigz Die (113466) for the Big Shot! This box goes together easily with some sticky strip and then you can top if off as desired. Here a satin ribbon and punch art flower add finishing touches. Cut Pillow Box out of Crumb Cake cardstock using Big Shot. Stamp snowflake from Season of Joy randomly on box using Versamark. Assemble box by adding sticky strip along the flap and on one end. Run Real Red Satin Ribbon around the box end to end, securing seams on the back of the box with SNAIL. Punch two Five Petal Flowers out of Real Red and then stick them together using SNAIL. Punch little flower from Trio Package out of Old Olive and then add to centre of flower using SNAIL. Stamp "merry" from Tiny Tags in Real Red on Very Vanilla cardstock. Punch out with Jewellery Tag. Set brad from Vintage Trinkets through tab on tag and then through the flower layers using the paper piercing tool. 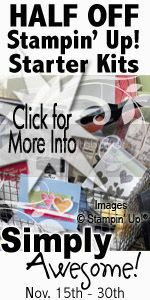 Attach tag to secure tag with a Stampin' Dimensional underneath. Secure flower to box using Stampin' Dimensionals. Punches and the Big Shot are a winning combination for all of you holiday gift packaging needs. To shop any of the supplies from this project please visit on my online store 24/7.